This time we look at the Rexing Formula Add On Wheel, manufactured in Croatia and closely based on the Ferrari SF15-T F1 wheel. 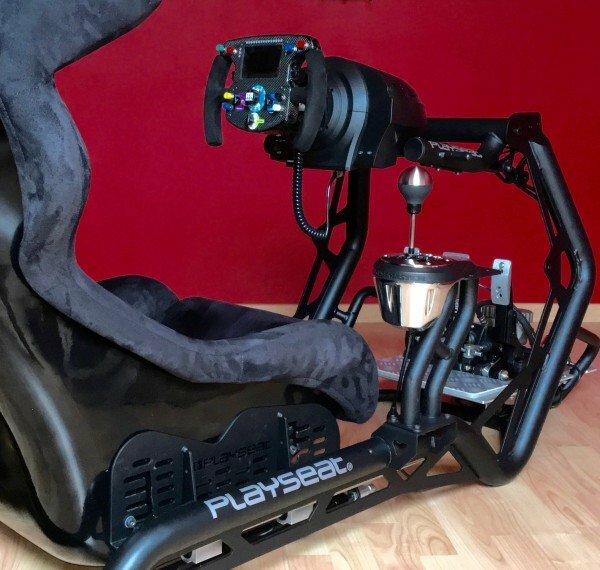 This rim is one of the newest add-on wheels available to sim racers looking to inject a lot more realism into their sim racing set-ups! The Rexing Formula Add On Wheel arrived at my front door in a fairly standard brown cardboard box. 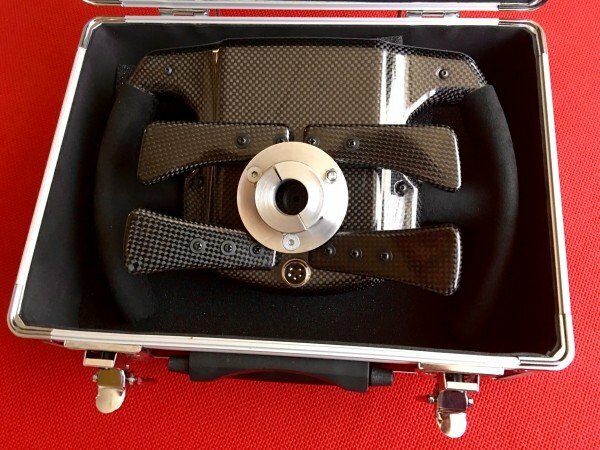 Once the box was opened, I was presented with a very smart looking aluminium case which was not only a chic form of protection for the wheel, but also for storing it stylishly when not in use. 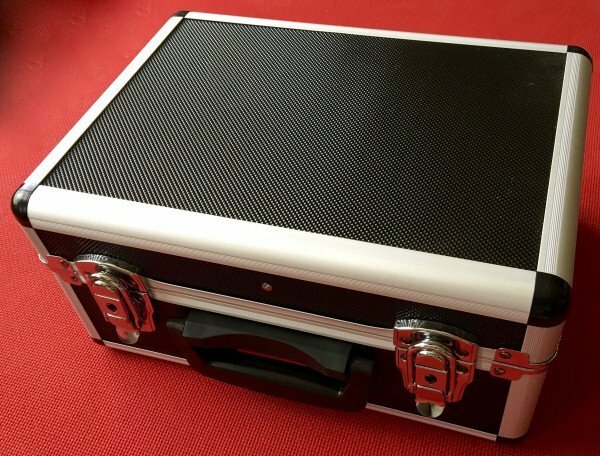 The aluminium case definitely adds an air of quality and purpose to its contents! The wheel rim itself is beautifully crafted in carbon fibre, including the four paddles on the rear of the assembly! All the buttons, rotary encoders and knobs have a high quality look and feel to them. The eight buttons (knitter switches, in this case) make a solid, positive and satisfying click when depressed. The five encoder knobs and the 12 position centre switch all have a smooth action when rotated in either direction. With the recent release of the Ferrari SF15-T in Assetto Corsa, it is plain to see that the SF15-T inspired Rexing to base their wheel on the Ferrari’s design. 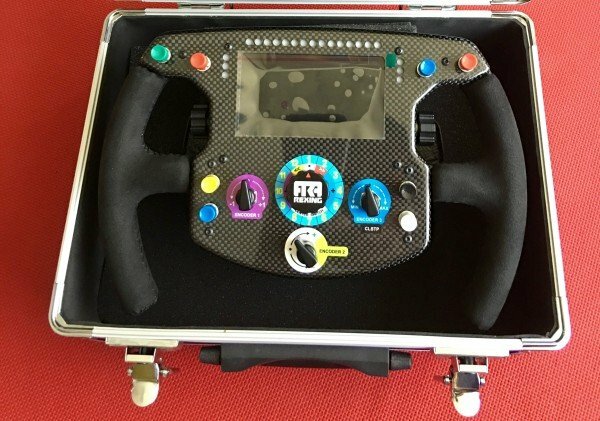 The shape and layout of the controls are very much in line with Ferrari’s 2015 F1 rim! The grips are professionally finished in Alcantara there is also a leather bound grip available which makes the grips a little thicker than the Alcantara version. All in all, this wheel exudes quality and looks as if it could be used in a real Formula -styled racing car! Unboxing the the Rexing Add On Wheel, there were also two adaptors supplied. One was a very sturdy metal Q1R quick-release adaptor with the standard 70mm mounting pattern for use with OSW or Bodnar style direct drive motors, as well as with the supplied Thrustmaster plastic adaptor. 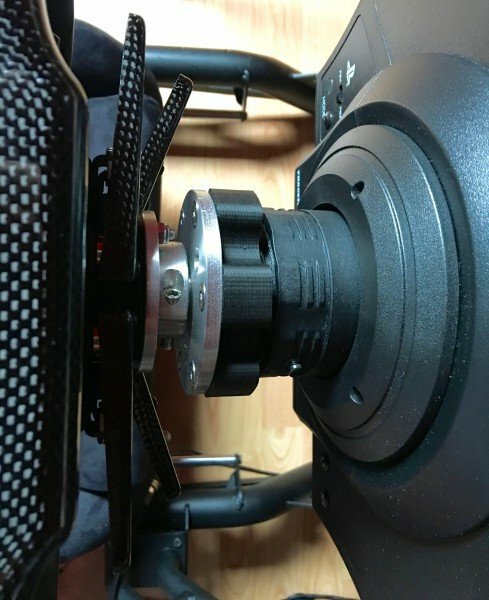 However, should the wheel be used with a Direct Drive motor, there is a need for an extra 70mm adaptor to be fitted to the shaft in order to facilitate mounting the Q1R quick-release in this fashion. 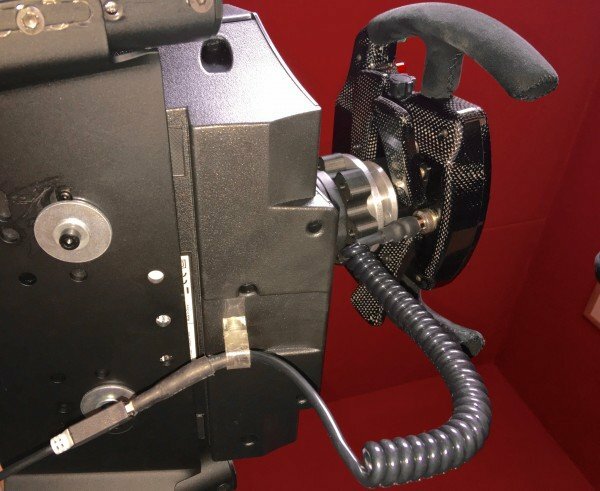 Conversely, the wheel can be bolted straight to a 70mm adaptor making it a semi-permanent connection. 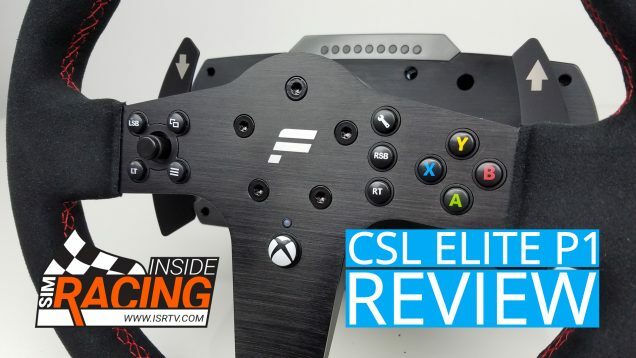 The other adaptor supplied is made of plastic and allows the wheel to be attached to all Thrustmaster bases that use the Thrustmaster ecco system quick-release. Also included in the packaging was a short spiral USB connecting cable. 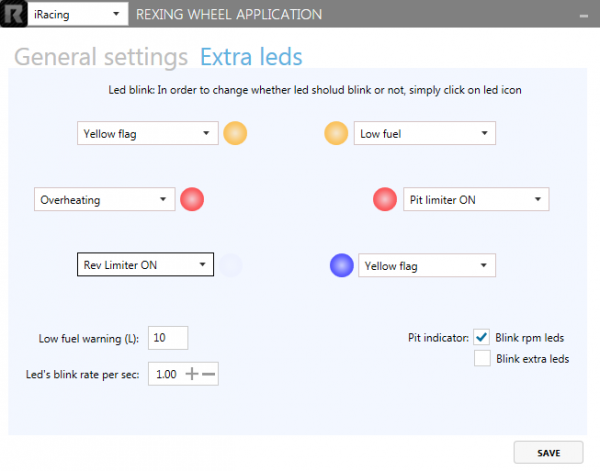 The Rexing Formula Add On Wheel is also available hot-plugged for direct mounting to a number of wheelbases, eliminating the need for a USB cable and extra adaptors. 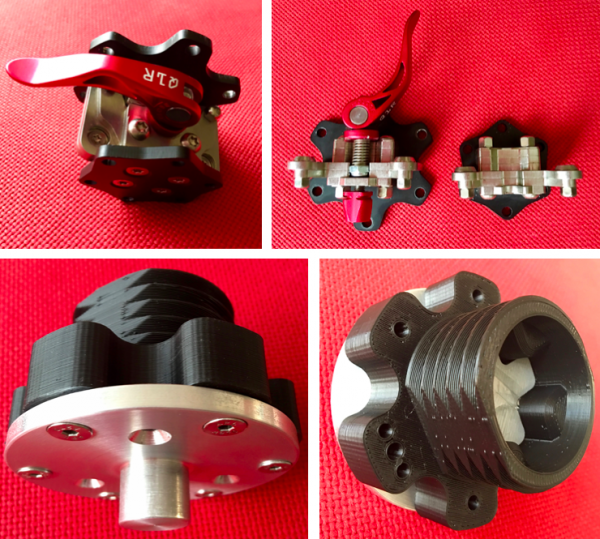 The Rexing wheel can also be connected to your wheelbase with a quick release connector and wiring, or with hard mount internal wiring. However, using the USB cable and adaptor gives you the freedom to mount the wheel to other bases, such as an OSW or Bodnar! The test wheelbase for the Rexing wheel rim is the Thrustmaster T300RS. To mount the wheel to the T300RS, I used the supplied plastic Thrustmaster wheelbase adaptor. This adaptor was used in place of the metal Q1R quick-release mechanism mainly because the extra length added to the steering column could place undue stress on the standard internals of the T300RS. As it stands, the column is extended by about 35mm or 1.38 inches over the standard Thrustmaster wheel rims when mounted. Mounting the the Rexing Add On wheel is quite a simple matter, the supplied machined aluminium circular plate with its stubby shaft is bolted to the plastic adaptor by means of the six included countersunk hex-patterned bolts. Once secure, the adaptor was oriented to mount on the T300RS’s wheelbase and using the large locking nut, it was securely attached. The following step was to mount the wheel and centre it as best I could before booting the wheel to self-calibrate. With the wheel centred by eye, I tightened the two grub-screws in the aluminium collar, which snuggly slid over the short aluminium shaft. Once tightened, the power cable was plugged into the wheelbase, then connecting the USB cable to my PC. A small note here, the supplied spiral USB to PC cable is quite short and requires a good quality USB male to female extension cable to reach the rear of my PC. Because the Thrustmaster wheelbase is hard-mounted to the Playseat Sensation Pro’s wheel deck, I pulled another MacGyver trick out of my hat and fabricated a cable holder from a plastic curtain-rod hanger. This was achieved by using the threaded portion of a bolt that was the exact fit for the hard-mount desk clamp hole on the underside of the wheelbase to fasten the holder to it. The solution gave me a neat centralised position for the spiral USB cable to pass through under the wheel itself and have a minimum of contact with my thighs during driving sessions! Booting the wheel up and letting it go through the self-calibrating process confirmed that my eyes still work reasonably well and the wheel was almost perfectly centred! A small adjustment and the wheel was in the right spot and ready for use! I noticed that the spiral cable is not very flexible, which means it is quite tightly wound around the steering column during calibration. So tight in fact, that the USB connection can be uncoupled by excessive winding of said cable. 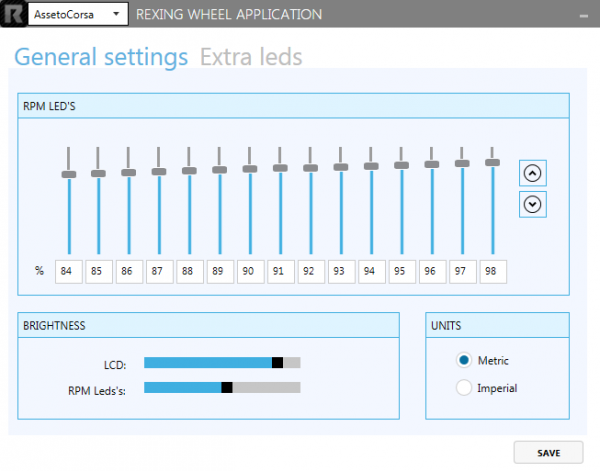 Rexing provide a free and paid ‘’Pro’’ version of their own software to control the screen brightness and intensity of the LEDs, as well as assigning extra LEDs to specific functions. Additionally, you can choose the display’s unit values should you need to do so. As far as the free software goes, this is where the adjustability ends. The Pro version (at the time of writing this article, July 2016) is still being worked on. I have requested a copy once it is ready for release, as this software will allow for much more flexibility when programming the wheel in differing titles. Some very cool features of the Pro software (work in progress) will be a selection of customisation options, plenty of different screens and real time telemetry for your car! The clutch paddles do not require any software in order to calibrate them, this can be simply carried out in-game by selecting the clutch paddle and fully retracting it to calibrate the clutch. When I receive the Pro software, I will update the article and relay my experiences with it ASAP. The 275mm or 10.8 inch wheel rim doesn’t feel small in my hands, although the Alcantara clad grips could be a little thicker. People with larger hands might like to opt for the leather clad grips when placing an order, as they are a little thicker than the test model’s grips you see here. The weight of the wheel is totally acceptable. Depending on the options that are chosen during the ordering process, this wheel tips the scales at around 1.35 kilograms or 2.97 pounds. Most of the titles I tested the wheel with immediately recognised it as a Rexing Formula Add On Wheel and the functions I wanted were easily mapped to the wheels buttons and rotaries. After having mapped the functions to the wheel’s buttons and a couple of the rotary encoders for brake bias adjustment in-game, I was ready to turn some laps! Looking at the in-house designed display screen, it is very crisp and displays most of the information you see in-game on your display in high contrast. 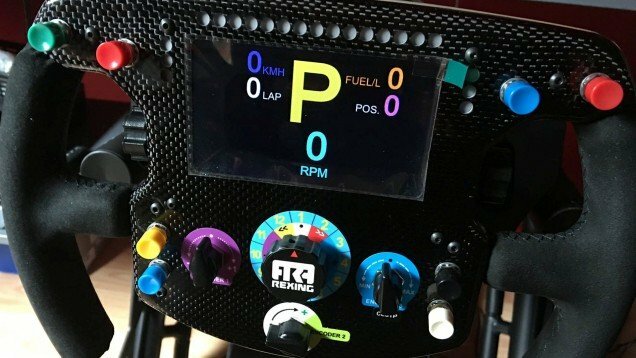 With the standard free software, I am presented with basic lap times and deltas, as well as gear selection, rpm, speed and in the case of racing cars equipped with DRS and ERS or KERS, the indicators are also displayed on-screen. In Project Cars and iRacing, the dash information is almost identical to what you see on the in-game car’s dash! My first title of choice was iRacing. With the rim being a formula rim, naturally I opted for the McLaren MP4-30 at Imola. I set the wheel up with the top outer two Knitter buttons for DRS (left) and ERS (right), furthermore I mapped the bottom left button for activating and de-activating the pit-lane limiter and the bottom right button for resetting the car. The rotary knob located at the bottom centre of the wheel face was mapped for front to rear brake bias adjustment. Sitting in the pits, I activated the pit-lane limiter and the rev lights sprung into life, flashing rhythmically to notify me of my choice. Selecting first, the McLaren clunks into gear. I release the left hand clutch paddle and with a boot full of revs, the car wheelspins from its position and is quickly bouncing off the rev limiter. Leaving the pit-lane exit, I de-activate the pit-lane limiter, the LEDs shoot to the right almost faster than I can blink! Before I know it, I am in 7th gear and going way too fast for the first chicane! I haven’t even tried DRS or ERS yet! 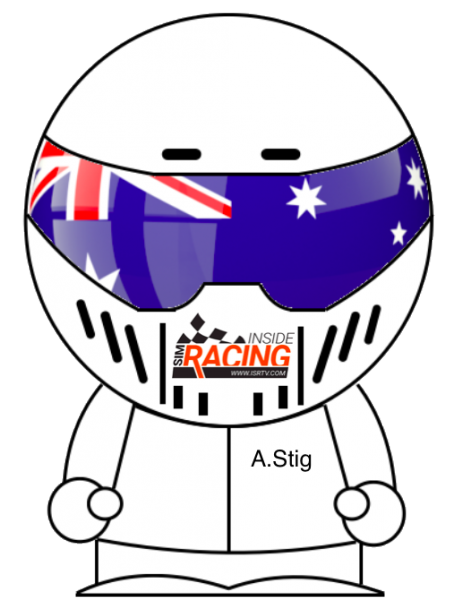 All of a sudden I have a newfound appreciation for F1 and Prototype drivers. Regarding their complex steering wheels it must be almost overwhelming to have to commit to memory what all the switches and rotaries do, as well as combinations of the two to engage other functions! The wheel feels quite comfortable to hold, although as I stated earlier, the grips could be a little thicker for me. The buttons I mapped are easily reached with my thumbs, as are the rotaries with my gloved fingers. I use gloves all the time now when sim racing, mainly to protect the suede and Alcantara grips from wear, but also for immersion and comfort. The feeling the wheel imparts is one of quality and accuracy when driving! The knitter buttons have a very positive click, as does the central rotary switch. The display is super crisp even in strong daylight, in a darkened room or person-cave it is akin to a well-lit Chrissy tree! The shifter paddles have a very positive and definite click, which is caused by the strong magnets. Internally, the mechanical switches complete the shifter’s electrical connection. With a definite and audible click, they could be seen as noisy if you have a roommate or neighbours that noise sensitive. The clutch paddles are smooth, silent and positive when engaging or dis-engaging them. The clutch paddles employ magnets to facilitate the analogue signal while springs provide the mechanical resistance.These clutch paddles make for very immersive Formula style starts! However, all four paddles are not adjustable for throw or sensitivity. Hitting the ERS designated button, I hold it in for the duration of the time I wish to use it for. It is very cool to see the ERS meter working on the dash’s display! Driving the McLaren with this wheel takes the immersion level to a new height indeed, I definitely feel that I am more engaged with how the car is driven than if this were all to be done for me automatically. I moved on to Assetto Corsa and tried several different cars until I decided to use the just released Ferrari SF15-T F1. Sitting in the cockpit and staring at the on-screen wheel, I had to do a double take, as the Rexing rim is almost identical in appearance to the Ferrari! This is where the wheel really comes to life and mimics the Assetto Corsa version beautifully! 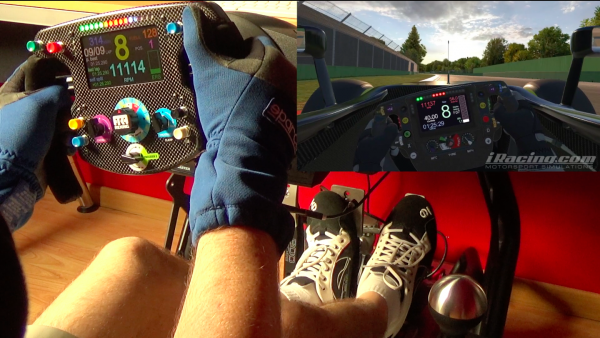 Across all the titles I tested the wheel in, I had no issues with it working, aside from a strange glitch in Assetto Corsa where the LEDs would get stuck on maximum revs. Happily this glitch seems to have rectified itself with the most recent updates of the game. I was in contact with Rexing regarding this glitch and they could not replicate it on their systems. It had to be something in my install that was causing it to do this. That glitch aside, the wheel has functioned dependably in all tested titles, the connection via USB is stable, the physical connection to the Thrustmaster T300RS wheelbase is equally as dependable, not once working loose over the weeks I have used the wheel. There are also no adverse effects on the internals of the wheelbase with this slightly extended steering column length, the Thrustmaster feels as it did with the 599 Evo or standard rims attached to it. I plan on further testing the wheel on an OSW type wheelbase to get an overall impression of the wheel combined with equipment that has more linearity and torque than the mass produced wheels. As with most high end equipment, we all know that this is going to be expensive. I will list the price for this Rexing Formula Add On Wheel as it was delivered to me, with the chosen extra cost options. The stated prices were correct at the time of publication, July 2016. All prices were taken from the official Rexing website webshop page. For sales tax, duties and worldwide shipping costs, please check the Rexing website. The Rexing Formula Add On Wheel is a very well constructed wheel rim. With the expert use of carbon fibre for the main body and all four paddles, the wheel has a definite racing car look and feel! 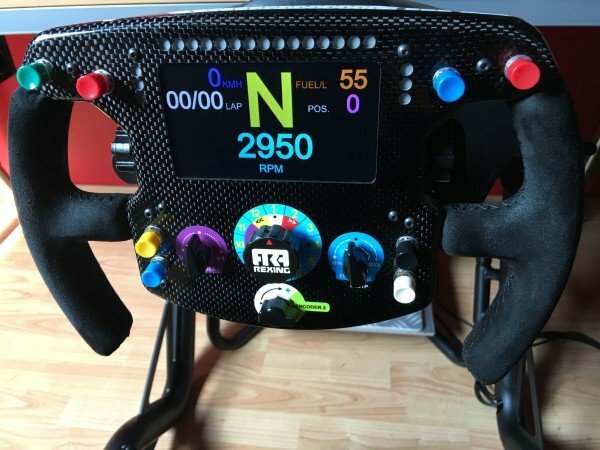 The operation of all buttons and switches are as you would find them on a real world racing wheel! The Rexing deigned multi- colour matte display is a pleasure to look at and displays the car’s major information crisply and concisely. 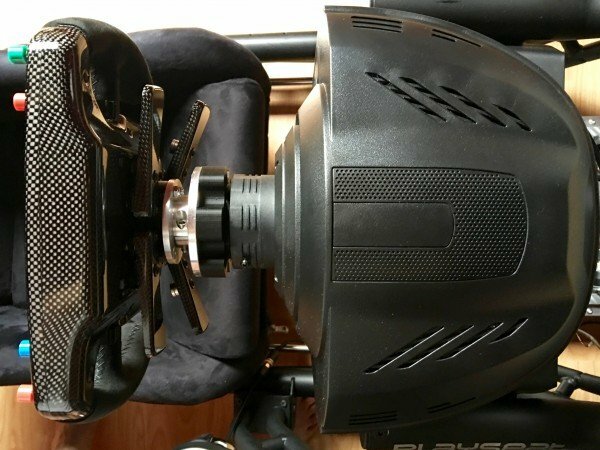 The LEDs can be very bright indeed, thankfully the series of slider controls in the free software allow you the option of dimming them all individually and to your own personal taste. Driving with the wheel, it does not feel overly small, despite its diminutive size. However, the Alcantara clad grips, which are an extra cost option, do feel a little on the smaller side in my hands. I would have liked a little more padding in them to give them a more substantial feel. 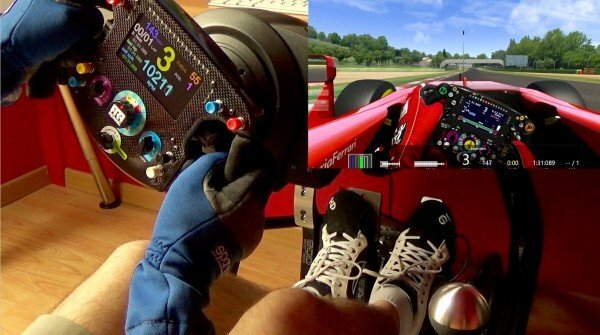 As its shape suggests, the Formula wheel is geared towards sim racing in modern, open wheel Formula cars. I would include Prototypes and modern DTM / GT3s as a good fit for the wheel, too! 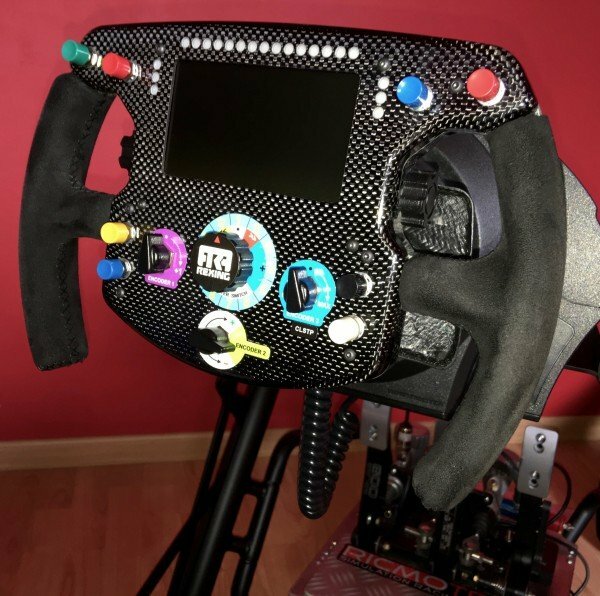 It is probably not as ideal for other types of sim racing cars, but after having used it as my main wheel for quite a number of weeks, I have become familiar with its size and feel. I can now happily drive most any car, including H patterned geared ones, in any title! Currently the wheel is being offered with a number of extra cost options at no extra cost for €1250,00 including tax. Going on the quality and options included in this temporary offer, I think the price is about right for this wheel. Looking at the extra costs, if all the options were to be added onto the base price of €1250,00 including tax, this wheel can become quite expensive! To sum up, the Rexing Formula Add On Wheel is a beautifully crafted wheel with exceptional build quality and finishes. This wheel would not look out of place in someone’s racing memorabilia display case when not in use, or for that matter, in a Formula series open wheeler about to take to the circuit! Even with new rims being released almost daily, I believe the Rexing wheel can rightfully take its place in this high end market segment. Next up, the ProSimU 3DOF motion rig review. Stay tuned, mate!